← Farewell Europe! Hello Canada! Here we go! Once again, we are taking to the rails! Sunday, September 10th, we will board VIA Rail and roll our way across to Vancouver, thanks to VIA Rail’s ‘Artists On Board’ program supporting musicians and artists with their travel. 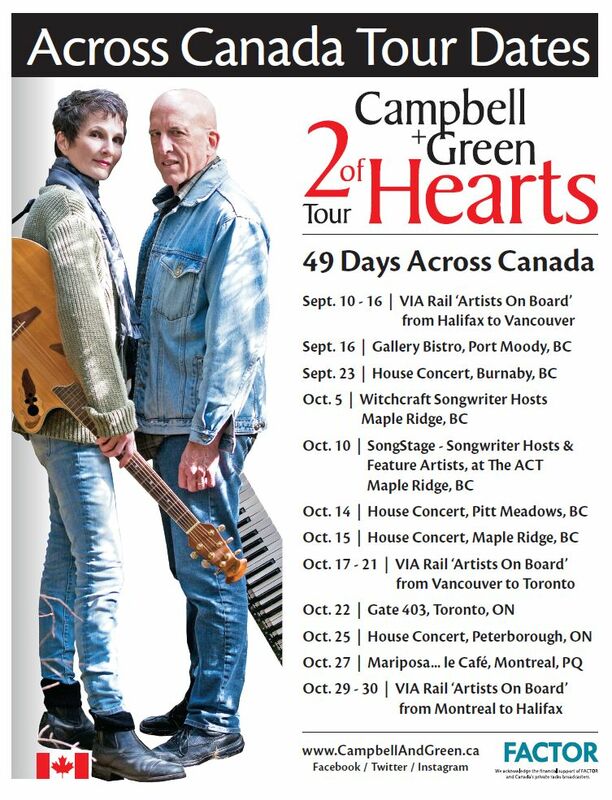 We play 3 sets a day on board and short sets at the Halifax, Winnipeg, Jasper and Vancouver Stations. Our previous rail experience to Montreal and back last spring was fabulous and we’re looking forward to meeting new folks in this intimate rolling venue. It’s a great way to interact and share songs and stories. Once back home, we’ll be playing a few local shows in Nova Scotia leading up to Christmas, some with the Monday Music Maven’s (the pop choir that Cailin directs). On November 1, Cailin will also be hanging her art at the Trellis Cafe in Hubbards, NS, for a month long show! To kick it off, we will be performing there on November 3rd. Look on our tour page for details.